Prosperity gospel n. a religious doctrine that financial blessing is the will of God for Christians, and that faith, positive speech, and donations to Christian ministries will increase one’s material wealth. Jesus n. The central figure of the Christian religion. Jesus conducted a mission of preaching and healing in Palestine in about ad 28-30, which is described in the Gospels. His followers considered him to be the Christ or Messiah and the Son of God, and belief in his resurrection from the dead is the central tenet of Christianity. “So don’t worry about these things, saying, ‘What will we eat? What will we drink? What will we wear?’ These things dominate the thoughts of unbelievers, but your heavenly Father already knows all your needs. Seek the Kingdom of God above all else, and live righteously, and he will give you everything you need” (Matthew 6:31-33, Luke 12:31). “Don’t store up treasures here on earth, where moths eat them and rust destroys them, and where thieves break in and steal. Store your treasures in heaven, where moths and rust cannot destroy, and thieves do not break in and steal. Wherever your treasure is, there the desires of your heart will also be” (Matthew 6:19-21). for you will be satisfied” (Luke 6:20-21). for a time of awful hunger awaits you” (Luke 6:24-25). “Sell your possessions and give to those in need. This will store up treasure for you in heaven! And the purses of heaven never get old or develop holes. Your treasure will be safe; no thief can steal it and no moth can destroy it. Wherever your treasure is, there the desires of your heart will also be” (Luke 9:33-34). Then Jesus said to his disciples, “If any of you wants to be my follower, you must turn from your selfish ways, take up your cross, and follow me. If you try to hang on to your life, you will lose it. But if you give up your life for my sake, you will save it. And what do you benefit if you gain the whole world but lose your own soul? Is anything worth more than your soul?” (Matthew 16:24-26). “And the King will say, ‘I tell you the truth, when you did it to one of the least of these my brothers and sisters, you were doing it to me!’” (Matthew 25:31-40) (See also 25:41-46). • Genuine Jesus or Counterfeit Christ? I was schooled for many years in the prosperity gospel, and the sad thing is that when these preachers die (and they do die), it’s an embarrassment to their followers and needs covered up. Several years ago, I was told that when one of these men died, he was sitting at the breakfast table and just gently passed on. 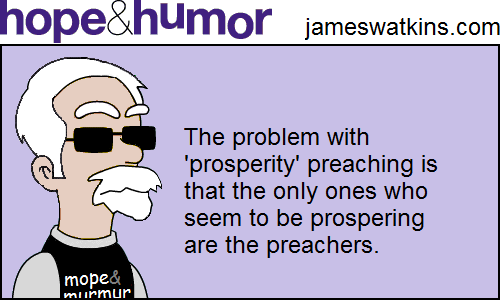 That’s the prosperity gospel way of going – quick and painless, in full control. But the truth is, the man *did* nod off at the breakfast table … after being in intensive care for a week, dying of an ailment he claimed to have been healed of. And that part of the story has been scrubbed. That’s a truly bent perception on how life works in this fallen world. Suffering does come, and although we would like to be in full, glorious control to the very end, that often doesn’t happen. Jesus chose the wretched poverty of our earthly existence because He thought we were worth it (Phil. 2). He also chose pain, and in so doing, showed us best how to bear our own crosses. We don’t often think of bearing our cross as a form of worship, offered up to God, but that might be worth considering. Well said, Michael! That’s the point of my SQUEEZING GOOD OUT OF BAD book. It is pain and suffering, not “health and wealth,” that conform us to the image of Christ (Romans 8:28-29). Yeah..I just don’t get the actual Biblical pastors, the ones I’d say, do preach the gospel as it is written and yet still set out to raise money for more magnificent buildings that have nothing to do with glorifying God. (although I’ve heard them compare Solomon’s temple as evidence that God does want us to glorify him thru extravagance) I’m not saying we should let our churches fall into rubble, but how many outdoor aesthitic water fountains does one church need? (if any) How large does the foyer need to be? I realize that a lot of the “mega churches” also do a lot of ministry outside the walls of the church, but could they do more instead of building a new baseball field or adding new work out equipment to the gym. I don’t know… There’s nothing wrong with baseball or work out equipment (if you use it), just seems like there’s so much hunger, pain, illness, in the world that needs our attention so much more. What is the key to unlocking all these blessings into our lives? The key is unconditional, sincere and wholehearted giving. We must follow the principles that the Son of God taught us, and it is the Financial Revolution. It means that the love offering that you gave is also the same measure you will receive from Him. Luke 6:38 is actually about giving forgiveness, not money. An example how the prosperity gospel preachers are teaching unbiblical principles. I don’t want to know more about this message. It is a counterfeit prosperity faith predicated upon greed; both pastoral and parishiner.